Is Hydrocodone Rehab Aftercare Necessary? Repeated use of hydrocodone precipitates acute withdrawal symptoms once use is stopped. Many of the symptoms continue far longer than the typical 10-day acute phase and put you at increased risk of relapse. Aftercare recognizes this and builds on the accomplishments of the formal treatment program for a long period after treatment/rehab is completed. Aftercare for hydrocodone dependence is critical. Post-acute withdrawal syndrome (PAWS) is a consequence of changes to the brain chemistry resulting from a sustained period of hydrocodone abuse and the attendant stress of trying to cope with life without the aid of hydrocodone. While treatment provides excellent resources to help you build skills and resilience to increase chances of sustained recovery, having a framework of recovery support services following the first phase of hydrocodone dependence treatment is strongly recommended, particularly to help navigate the high-risk period of 6 to 24 months after becoming abstinent. Treatment interventions--including aftercare--are known to have positive outcomes when they are of longer duration, with significant results lasting at least 12 months. Aftercare treatment for hydrocodone dependence works. If you or someone you love are hydrocodone dependent, and looking for treatment options, please call 1-888-993-3112Who Answers? 24 hours/day to speak with one of our treatment support team members. According to addiction treatment research, the likelihood of relapse after becoming abstinent from hydrocodone dependence is extremely high. Addictions to hydrocodone and other opioids can be particularly tenacious and reports indicate as much of an 85% chance of relapse at one year after stopping opioid use. RP is part of a continuum of care that must be engaged in completely to ensure that you are part of the 15% who do not relapse after treatment. Learning to change behaviors associated with active addiction so that high-risk situations are appropriately and effectively dealt with or avoided. Mindfulness-based relapse prevention (MBRP) helps to deal with the 'clinging' nature of craving for the drug, showing significant reductions following treatment. Unfortunately, many recovering hydrocodone addicts do not take advantage of aftercare services and, unlike other addictions where a lapse could mean drinking a beer, relapsing with hydrocodone can lead to overdosing since tolerance has likely abated - your body and mind are clean of the substance and cannot tolerate previously normal amounts of the drug. As with a chronic medical condition such as diabetes, addiction is a chronic brain disease that can be controlled through maintenance of sobriety and medication compliance. Treatment success is frequently determined by abstinence rates, which are a direct reflection upon your capacity to stay sober. Just as a diabetic can trigger their acute disease state by ignoring medication, exercise and nutrition guidelines, using hydrocodone after becoming clean initiates the disease cycle again. And as mentioned above, after a period of abstinence, using opioids can be life threatening because your body is drug na?ve. The behavior changes needed to maintain abstinence from hydrocodone are challenging, but there is now a body of research identifying which relapse prevention techniques are very effective in helping you sustain these changes. As with trying to institute any major behavior modifications/new habits/improved decision-making, it is unlikely that this will succeed 100% of the time without setbacks. Learning that setbacks are part of life, with or without hydrocodone (and that there are more effective coping skills than drug use) takes time. Relapse does not need to totally derail your recovery. Individuals trained in hydrocodone dependence treatment understand this concept and have practical solutions to help you keep moving forward, even after a slip. Call 1-888-993-3112Who Answers? 24 hours a day to speak with a caring member of our treatment support staff about the best hydrocodone addiction treatment options for you or your loved one. 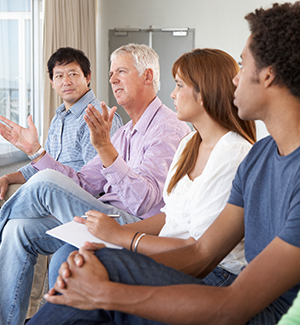 Group counseling: Research has demonstrated that group counseling or therapy enhances the effectiveness of the "treatment as usual" program of recovery. Given the social stigma and isolation associated with drug addiction, group members with longer periods of recovery can act as models and as 'buddies' within and outside the group. More about group counseling is detailed below. Self-help groups: These would include 12-step support groups such as Narcotics Anonymous, and non-12 step counterparts such as SMART Recovery. Individual therapy: This allows the therapist the flexibility to concentrate on issues as they arise for the individual, helps to maintain confidentiality with problems related to substance abuse, and does not involve admission to an ongoing group. Medically Assisted Treatment: According to the American Society of Addiction Medicine (ASAM), medication maintenance and outpatient therapy is as useful as inpatient care for 95 percent of opioid-dependent patients. Making the choice to engage in long-term aftercare recovery support services is often as much an indicator of the likelihood of successful recovery as is the specific type of therapy and counseling interventions selected. Studies have shown that the likelihood of remaining abstinent and staying in treatment is greatly improved by group therapy. It is believed by researchers that this is due to the sense of belonging and affiliation with the group, affirmation and confrontation by the group, and gratification. The struggle of addiction is marked by poor self-control mechanisms. The group provides a strong source of external control, with the ability to identify warning signs or concealment of relapse. Total abstinence as the goal. Complete acceptance of disease control (powerlessness over hydrocodone). 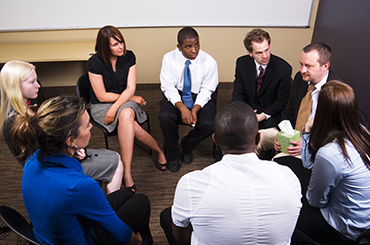 Active participation and application of principles learned in 12-step meetings such as Narcotics Anonymous. Although research on the efficacy of 12-step programs is limited, some studies indicate that self-reports of spiritual awakening due to 12-step participaition may predict absitnence, even though meeting atendance by itself is not a strong predictor of outcomes. During hydrocodone detoxification, medications such as clonidine, suboxone and trazadone might be used to help reduce acute symptoms. During treatment and aftercare, medication maintenance with suboxone or methadone is recommended to assist in recovery. According to the Substance Abuse and Mental Health Services Administration (SAMHSA), the use of suboxone particularly helps with relapse prevention and reduces cravings. Appropriately prescribed and dosed buprenorphine (Suboxone(R) Subutex(R)) or methadone is associated with reduced illicit drug use, minimal euphoria, reduced withdrawal, and decreased adverse consequences of problematic use (HIV, Hepatitis B, C, and overdose). Since many people become dependent on hydrocodone after initially using it for pain issues, ongoing non-opioid pain management therapies such as acupuncture, hypnosis, movement classes, and yoga might be prescribed instead to address chronic pain issues. It is possible to treat recovering hydrocodone addicts with chronic pain issues with opioids. With addiction in remission, optimal functioning with appropriate opioid use can, in some instances, be accomplished in tandem with durable relapse prevention strategies and cognitive-behavioral intervention. A Therapeutic Community (TC) is a "drug-free residential setting that uses a hierarchical model with treatment stages that reflect increased levels of personal and social responsibility. Peer influence, mediated through a variety of group processes, is used to help individuals learn and assimilate social norms and develop more effective social skills." addiction and related issues, who need to learn new lifestyles and avoid antisocial activities, have been treated very successfully in TC environments, reducing drug use and criminal activity, while promoting work skills and prosocial activity. Addiction is a primary, chronic disease of brain reward, motivation, memory and related circuitry. Like other chronic diseases, addiction often involves cycles of relapse and remission. While you are developing a new toolbox of positive life strategies, constraining old patterns of behavior will likely be your biggest challenge, and something at which relatively few people totally succeed, particularly in early recovery. Looking for a proper aftercare program at this stage can be challenging, but don't worry, our treatment support staff is available to speak with you about potential options. Please call 1-888-993-3112Who Answers? today. Contingency management (CM) is an incentive-based treatment approach that has been shown to be effective as part of a comprehensive hydrocodone aftercare plan. CM promotes recovery support compliance by offering vouchers, prizes, and cash. As with other drug dependency treatment, when combined with CBT, CM has been shown to be more effective because underlying negative behaviors and emotions are investigated while improving motivation to stay abstinent. Having a family member or friend caught in the agonizing grip of addiction is extremely difficult. The natural tendency is to want to take action to help or even force the addict to stop. Remember, no one can help an addict stop using hydrocodone until they are ready to stop for their own personal motivations. Does the treatment program use evidence-based practices? Are all the institutional licenses and medical staff credentials up to date? Are the treatment center success rates available for review? Does your loved one share the treatment philosophy of the treatment center? Do they provide a comprehensive aftercare program that fits your loved one's specific needs? The strongest recommendation that 12-step groups have for friends and family of anyone with substance dependence is to ensure your own positive life journey. This is the best gift you can give to your loved one struggling with hydrocodone addiction. Chang, Y-P, and Compton, P. (2013). Management of Chronic Pain with Chronic Opioid Therapy in Patients with Substance Use Disorders. Addict Sci Clin Pract 8(1): 21. Daley, D.C., et al. (2009). Group Therapies. In Ries, R.K., et al., eds., Principles of Addiction Medicine. Fourth Edition. Philadelphia, PA: Lippincott, Williams & Wilkins, pp. 757-767. ONDCP. (2011). Epidemic: Responding to America's Prescription Drug Abuse Crisis. US Office of National Drug Control Policy, The White House, Washington, D.C.
Rounsaville, B.J., et al. (2009). Individual Psychotherapy. In Ries et al., eds. Previously cited. SAMHSA. Results from the 2011 National Survey on Drug Use and Health (NSDUH): National Findings. (2012). Substance Abuse and Mental Health Services Administration, U.S. Dept. of Health and Human Services, National Institutes of Health; Rockville, MD. Strobbe, S., et al. (2013). Spiritual Awakening Predicts Imporved Drinking Outcomes in a Polish Treatment Sample. Journal of Addictions Nursing 24(4): 209-216. Tetrault, J.M., and Fiellin, D.A. (2012). Current and Potential Pharmacological Treatments for Maintenance Therapy in Opioid-Dependent Individuals. Drugs 72(2): 217-228. UNODC. The Non-medical Use of Prescription Drugs: Policy direction issues. (2011) United Nations Office on Drugs and Crime, United Nations, Vienna. Williams, S. "What's it really like to withdraw from heroin and painkillers?" MINNPOST Mental Health and Addiction, 2/14/14. Witkiewitz, K. et al.,(2013). Mindfulness-Based Relapse Prevention for Substance Craving. Addict Behav, 38(2): 1563-1571.